Here are some facts about Walt Disney. 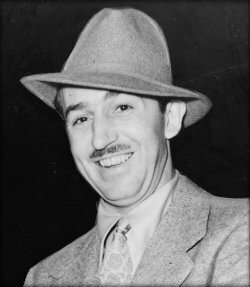 Walt Disney is one of the best known names in entertainment and is famous for founding the Disney company. He was also a screenwriter, producer, entrepreneur and voice over actor. Walt Disney was born in Chicago in 1901 and enjoyed drawing cartoons while at college. He produced his own cartoons and opened his own studio, Laugh-O-Gram, which did not make any money. He never graduated from high school, leaving at the age of 16. He later received honorary degrees from several respected universities, including Harvard and Yale. During World War 1, Walt Disney was not allowed to fight as he was too young. He joined the Red Cross instead, driving an ambulance in France. Mickey Mouse was created in the 1920s, inspired by a pet mouse Disney had owned. Disney provided the voice for the character, who was originally going to be called Mortimer Mouse, until 1947. In 1932, Disney won a special Oscar for creating Mickey Mouse. During his long career, Walt Disney won 32 Oscars as well as the Legion of Honour award from France. Walt Disney admitted to being terrified when having to face the cameras. He often ate his lunch at his desk, his favourite meal being chili, beans, crackers and tomato juice. Disney often used aliases. When looking for land for his theme park, he called himself MT Lott, and he often called himself Retlaw Yensid, which is his name backwards. Disneyland opened in California in 1955. Within a month of it opening, over a million people had visited the park, which still keeps a light on in the room where Disney worked. Walt Disney died in 1966 from lung cancer; he was a heavy smoker most of his life. He was buried in a California cemetery, although rumours still persist that his frozen body was stored under a ride in Disneyland. Walt Disney also created the characters Minnie Mouse and Donlad Duck. Walt Disney autographs are often sold for thousands of dollars. In the 2013 movie Saving Mr. Banks, about how the Disney film Mary Poppins came to be, Tom Hanks plays the role of Walt Disney.